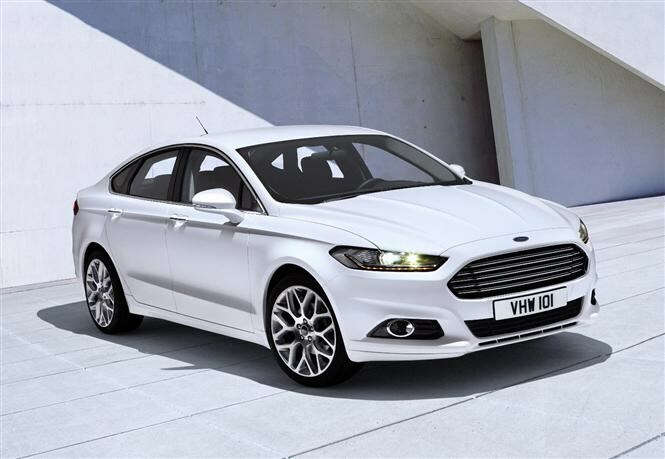 The swish-looking all-new Ford Mondeo has been revealed and it will replace the current model in 2014. Ford says the new car will have a premium interior and it will also be the first car in the segment to have a 1.0-litre powerplant in its engine line-up. The 1.0-litre engine has already been used in the Focus, B-Max, Fiesta and C-Max models and it is the smallest ever engine to be fitted in such a large family car. Ford says the 124bhp engine offers best-in-class fuel economy and CO2 emissions of 130g/km. It will deliver 170Nm of torque and up to 200Nm in overboost mode, delivered from just 1,450rpm. The turbocharged engine features twin independent variable camshaft timing. The fuel-saving 1.0-litre EcoBoost petrol engine will be among a range of petrol and diesel engines available in the new Mondeo but there will also be a petrol/electric hybrid offered - another first for the family saloon segment. There will also be an all-wheel-drive diesel in the Mondeo range. It is quite a sizeable departure from the current model. With an almost Aston Martin-like grille and a lower roofline, Ford is hoping to steal back established customers who have defected to the BMW brand. The stylish grille, the so-called 'powerdome' bonnet and the inclusion of LED headlamps does give the car a more purposeful look. For the first time a Mondeo can be ordered with a retractable glass roof as well as adaptive full LED high-beam, low-beam and signal lighting. Quicker to illuminate than standard headlamps, they promise improved durability and better energy efficiency than traditional filament bulb lights. The Mondeo's adaptive headlamps turn with the steering wheel and adapt beam projection to vehicle speed to provide a greater depth of illumination at high speeds and a wider field of vision at slower speeds. Another first will be the inclusion of Ford's new infotainment system called SYNC with MyFord Touch. This features advanced voice-activated technology that allows the driver to change music and input sat-nav directions simply by talking to the system. The system also has an eight-inch colour touchscreen and it can act as a WiFi hotspot for up to five mobile devices. The all-new Mondeo also marks the European debut of Ford's rear inflatable seatbelts which are designed to reduce head, neck and chest injuries for rear-seat passengers. For more information, keep an eye out for the full Ford Mondeo review coming soon.